Summary : The home of the Margherita pie is a must-stop on Naples pizza tour. The restaurant itself is fancier that many other spots in the city and the prices a little higher. Yet its pizza is just as good. After a sub-par lunch at Da Michele during our first day in Naples, Scott and I were hoping for a more impressive dinner. 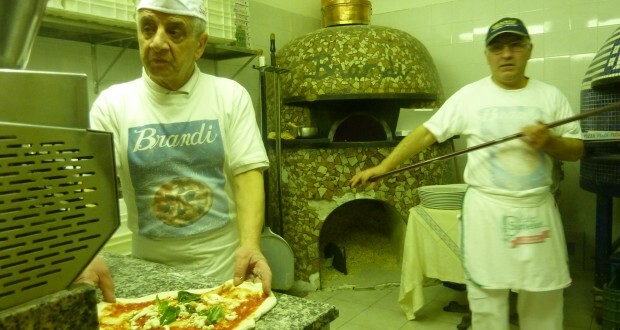 We headed to Pizzeria Brandi (1-2, Salita S. Anna di Palazzo, 081-416928) which is located in a picturesque alley near Piazza Piebiscito (a 10 minute walk from Castle Nuovo). 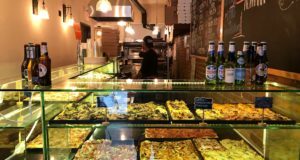 Although the pizzeria attracts a good deal of tourists, it is a bit farther from the main tourist area where many of the other famous pizza places are located. Nevertheless, Brandi has quite the claim to fame — legend has it that the Margherita pizza was invented there. The story goes something like this: In 1889, Queen Margherita of Savoy asked Raffaele Esposito, who was a famous chef working at Brandi, for a special meal that would satisfy both her and the hungry population. 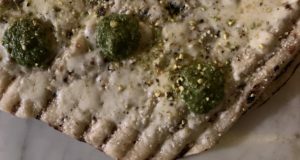 Esposito prepared a few items, one of which was a hot bread with some vegetables that resembled the Italian flag — green basil, white mozzarella, and red tomato. It was a hit with the queen, and thus, the Margherita pie was born. Although the story has take on different forms over the years, one thing was for sure — I wasn’t leaving Naples without trying a Margherita pie at Brandi. We arrived at Brandi around 8PM on a Wednesday evening, and the first thing I noticed was that the setup at the pizzeria is a little odd. The main structure is two levels; on the first level is the kitchen, oven, and take out counter. On the second level is a dining area. Then, across the alleyway, there is another dining room. We were seated there. The tables were dressed with nice tablecloths. Beautiful artwork adorned the walls. And a gentleman with an acoustic guitar serenaded us during our meal. Talk about fancy! It sort of felt like were were eating at a rich relative’s home. The way in which the room was organized elicited a very comforting feel. Most of the action, however, was back across the alleyway where pizzas were being popped in and out of the wood fired oven. The pizza itself was noticeably different from that at Da Michele. The Margherita pie held together well and contained a puffier crust than we’d had earlier in the day. Although it certainly wasn’t the best Margherita pie I had in Naples, it contained two qualities that I was particularly fond of. First, there was a good amount of basil on the pie. Although this is atypical in Naples, who doesn’t love a little extra basil? Second, the pie was not so large that it hung off the plate. Thus, it was easier to handle. It’s generally believed that bigger is better when it comes to pizza. And almost every place where we ate in Naples served us what appeared to be super-sized pies (experts would note that these pies — approximately 34-35 mm in diameter – are actually standard, but they are larger than pies served at Neapolitan pizzerias in the States). At Brandi, however, the pie fit perfectly on the plate and thus, was not as difficult to work through as, say, the pizza at Da Michele. Size does matter. We also decided to mix things up and order a Totò — a fried calzone with ricotta, provola cheese, and cracklings. Although filling, it could have used more flavor and is not recommended. It’s worth noting that many locals — especially young folks — don’t typically eat at Brandi because it’s one of the more expensive places in town. As you may recall, our Margherita pie at Da Michele cost only €4.50 (about $6.00). The same pie at Brandi was €8.50 (about $11.50). And the Totò was €11.50 (about $16.00) Our total bill came out to €26.00 (about $37), easily the most expensive pizza place we at at in Naples. As we were leaving, I did notice a sign by the take out counter with significantly lower prices than what we paid. In fact, if you order a Margherita pie to-go, the price drops all the way to €3.50 (about $4.50). 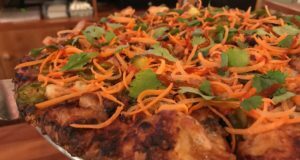 It might be in your financial interest to grab a pie for the road, although there is something to say for the experience of dining at Brandi.